Are you interested in open sea, near coastal, archipelago or inland navigation? We offer training areas in all the above-mentioned segments. In our navigation simulator you can do efficient training on a certain focus area. Utilizing our real instrumentation from various market leading brands you will navigate just as you would be onboard. Our navigation bridges are equipped with the latest integrated bridge systems (IBS) from Wärtsilä NACOS Platinum, Sperry Marine, Consilium (including ice radar), Furuno and Transas. Our desktop simulator classroom equipped with 8 mini bridges is a very efficient tool for basic navigation training. The mini bridges are equipped virtual navigation equipment and controls such as radar, electronic chart display, autopilot, GPS. Sailing areas all around the world can be utilized in this simulator as well as a large amount of different ship models. The desktop simulator is perfect for a non professional navigator who likes to improve her/his skills in navigation and use of radar. 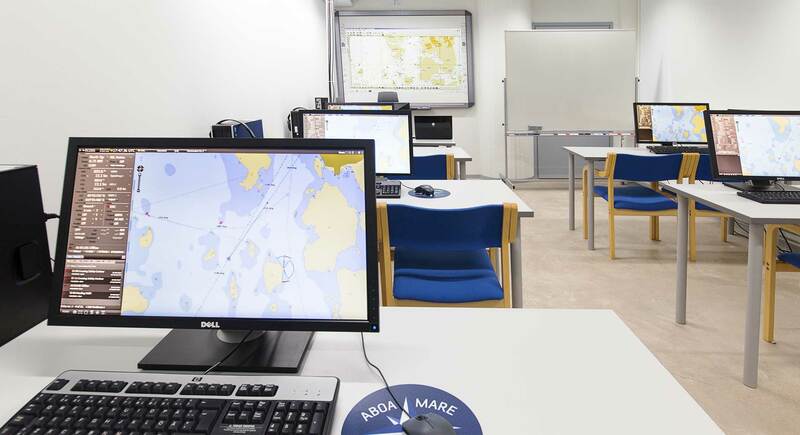 To support our ECDIS training courses we have three ECDIS classrooms equipped with Consilium, Wärtsilä NACOS Platinum and Furuno ECDIS workstations.